Agents at the Department of State Security have alleged that some of the arrested judges collected bribe from departmental stores while some others traveled as far as Ghana, Benin republic and Niger republic to collect bribe. The Nation reports that the DSS has in its possession an audio and video tapes of some of the judges collecting bribe. While one of the judges just acquired a N1.5billion mansion, another allegedly collected bribe in a department store and one allegedly crossed the borders to Benin Republic, Niger Republic and Ghana to collect money. A Court of Appeal judge allegedly collected N200million but he was only recommended for retirement and the NJC directed him to refund the cash installmentally. 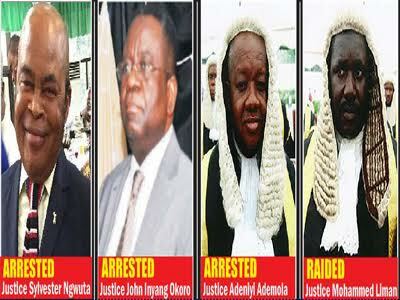 The detained judges include two Supreme Court judges-Justices Sylvester Ngwuta and Inyang Okoro; the suspended Presiding Justice of the Court of Appeal, Ilorin Division, Justice Mohammed Ladan Tsamiya, who was picked up in Sokoto; Justice Adeniyi Ademola( Federal High Court); the Chief Judge of Enugu State, Justice I. A. Umezulike; Justice Kabiru Auta of Kano State High Court; and Justice Muazu Pindiga( Gombe State High Court). He spoke of how the DSS decided to go through the NJC to invite the judges for investigation “in a less dramatic way”. Correspondences were exchanged between the NJC and the Federal Ministry of Justice for certain information and dossier. The Ministry of Justice complied but the NJC refused, he claimed.